An UberX driver keeps his Uber sticker in his car console when driving in Philly. The Philadelphia Parking Authority said Tuesday it would enforce the illegality of ridesharing services UberX and Lyft after a temporary agreement allowing them to operate expired Saturday. The authority also announced it would relax certain regulations against taxicabs, an industry that has fought against the rising popularity of ridesharing services, complaining that their unregulated competitors have driven down business. 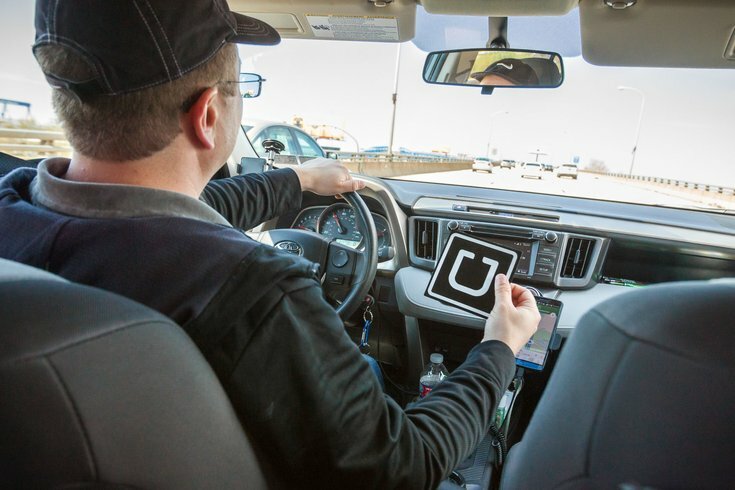 "While we understand that TNC (transportation network company) services (UberX and Lyft) are very popular with the public and many elected officials want to see them continue, with the expiration of Act 85, TNC service in now illegal in Philadelphia and the PPA is committed to enforcing the law," PPA Deputy Executive Director Corinne O'Connor said in a release. "As a result, the PPA is providing 48-hour notice that it will resume enforcement against illegal TNC service in Philadelphia." In July, Gov. Tom Wolf signed an agreement that allowed the two services to temporarily operate in Philadelphia. The agreement was reached in response to a perfect storm of transportation woes: the incoming Democratic National Convention, which brought thousands into the city for a weeklong period, and SEPTA's removal of 120 Regional Rail trains because of a structural defect. Attempts to extend the temporary agreement before Oct. 1 stalled. However, the state House does plan on taking up legislation on ridesharing services when legislators return to Harrisburg on Monday, Oct 17. Currently, ridesharing services operate legally in the rest of the state under the regulation of the Pennsylvania Public Utilities Commission. In answer to many reporter questions, the House plans to take up the @Uber #Lyft legislation upon return to Session in October. 1. Drivers can remove taxi shields if an approved camera system is installed. 2. Taxis can operate with an increased mileage on their odometer, with the new limit set at 350,000 miles. 3. The requirement for semi-annual inspections has been waived until a vehicle reaches 200,000 miles. 4. The requirement for two-way radios has been waived, however, the PPA will continue to demand compliance with the panic switch requirement to protect drivers. 5. Drivers will be allowed to use stand-by vehicles if a problem causes their taxi to be out of commission. 6. The PPA will allow all driver training to be done by drivers or third parties, provided that a training program and syllabus are first approved. 7. The PPA will invite and expedite consideration of new meter technologies. 8. The PPA will also consider new technologies, such as apps, to be used for payment.